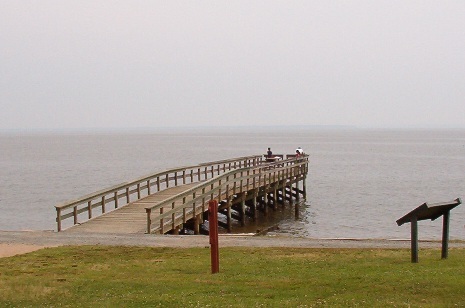 Westmoreland State Park was opened in 1936 as one of the six orignal ones in Virginia! It has about one and a half miles of water frontage along the beautiful Potomac River and its next door neighbors are the lands containing the former homes of both President George Washington and Robert E. Lee. Horsehead Cliffs provide visitors with a spectacular view of the Potomac. Look to the skies and you may even spot a bald eagle or two! Activities here include hiking, camping, fishing, boating, biking and swimming (in their great Olympic sized pool!) and hunting for fossilized shark's teeth. There's a Visitor Center, gift shop, snack bar and a boathouse that sells gas, ice, bait and other fishing supplies. Kayaks and rowboats are available for rent too. 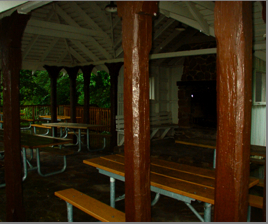 I have been here walking with my dogs, which they absolutely loved and I've also attended a picnic here, in Picnic Shelter 1, which makes you feel like you are up in the treetops. There's room for plenty of people and it has a great view of the river and the beach area. The walking trail behind it leads to the pool. 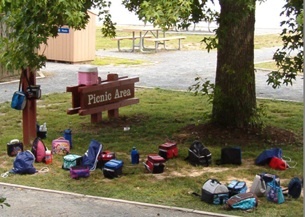 The park offers plenty of spaces for RV's and tents, rustic camping cabins as well as the more upscale five-bedroom Potomac River Retreat facility. These spaces can even be reserved online. Lots of options for fun things to do in the park's 1,311 acres! Keep an eye on their events calendar for special hikes and guided tours. There are also events such as holiday celebrations, wildlife tracking, cooking demonstrations, geocaching, fossil hikes, kayak tours and so much more! To get here from Colonial Beach, take Route 205 to Route 3 east and look for the entrance to the park on your left.